Semuiliki National Park is situated in western Uganda and covers an area of 221 sq km; all within the remote Semuliki Valley. Semiliki National Park borders on the Democratic Republic of Congo; an extension of the Great Ituri Forest of the Congo Basin. As such, the Semiliki Valley contains numerous features associated with Central rather than East Africa. 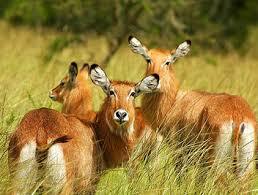 As well, there are wildlife species that are unique to Uganda for this reason. A Batwa Pygmy community that originates from the Itari, lives within the Park boundaries. The unique Sempaya Hot Springs are also to be found with Semuliki National Park. The wildlife ranges from widespread forest dwellers such as elephants and chimpanzee to the rather more localized De Brazza monkey and pygmy antelope. There are 3 tracks in the game reserve close to the park for Game Drives, which cross the savannah grasslands in the Toro Semliki Wildlife Reserve. Because of its uniqueness, Birding is very popular in Semuliki, as is hiking and nature walks. For travelers interested in a cultural encounter, the Batwa hunter-gatherers, who are totally dependent on the forests for food, medicine and shelter, are interesting to encounter and offer tours of their environment as well as Nature Walks in the park. Accommodation; The park has limited accommodation facilities, however, Ntoroko Game Lodge and Semliki Safari Lodge are two excellent options; driving to Fort Portal, 60 kms. from the gate, is another option; Here one can find a large variety of places to stay; accommodating all budgets. 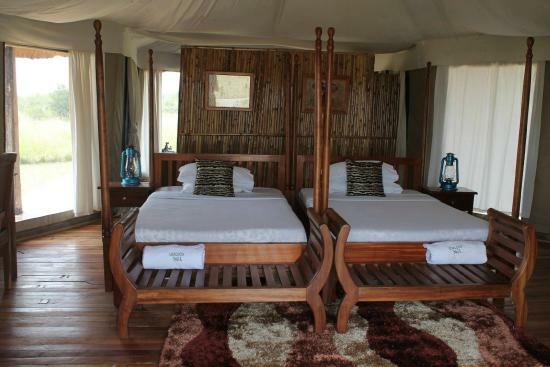 SEMLIKI SAFARI LODGE is a high-end ecotourist lodge. The accommodation is in luxury tents. Amenities include a full-stocked bar, first class restaurant and a swimming pool. The Lodge is within the Toro-Semliki Wildlife Reserve section of the Semuliki National Park. The Tents all have hardwood floor, and beautiful locally made furniture. Located in Semuliki Wildlife reserve right at the shores of Lake Albert. Ntoroko Game Lodge is a luxury Tented Camp nestled in the unspoiled beauty and breathtaking midst of wildlife. The only safari lodge with a natural sand beach.